Translate text into Calendar events. Is there a better alternative to Multi Event Filter? Is Multi Event Filter really the best app in Productivity category? Will Multi Event Filter work good on macOS 10.13.4? 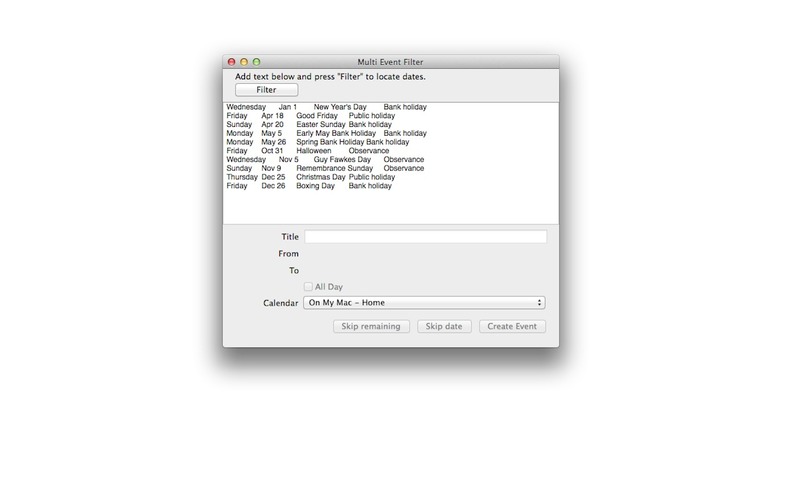 Multi Event Filter allows users to translate any text into events that load into OS X's Calendar application. Using text entry, cut and paste, or (possibly most usefully) running as a service, Multi Event Filter can process events from any application that contains text to be copied (from websites, emails, spreadsheets, anywhere else events are listed). You can then select, filter and modify the event information before adding to your calendar of choice in the Calendar application. Multi Event Filter needs a review. Be the first to review this app and get the discussion started! Multi Event Filter needs a rating. Be the first to rate this app and get the discussion started!